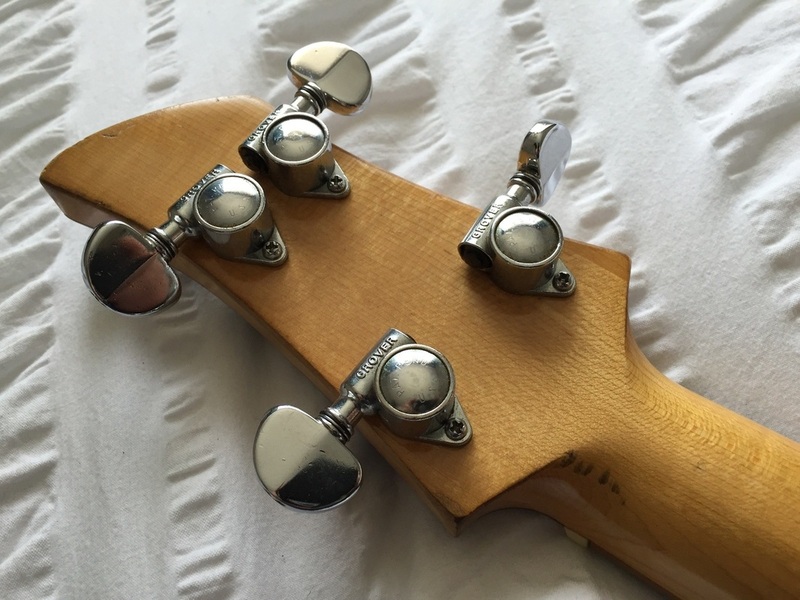 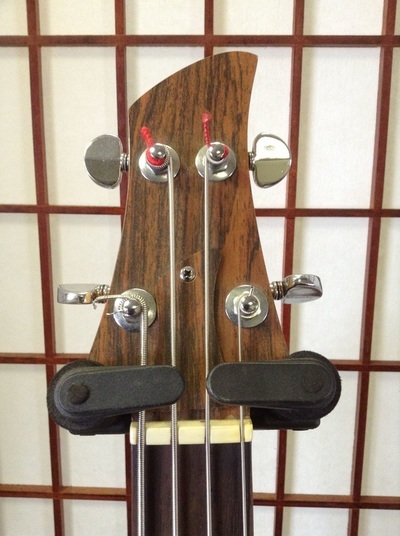 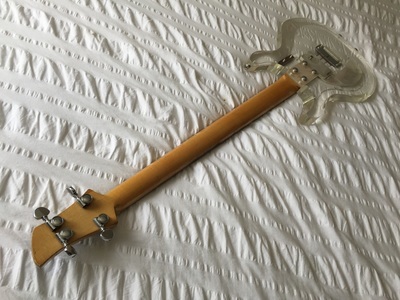 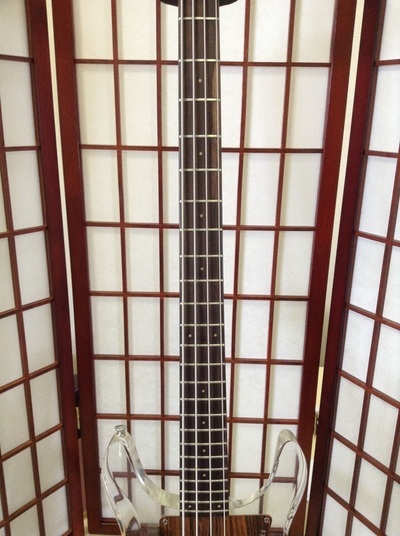 Very nice example of a 1970 DA bass with all original parts. 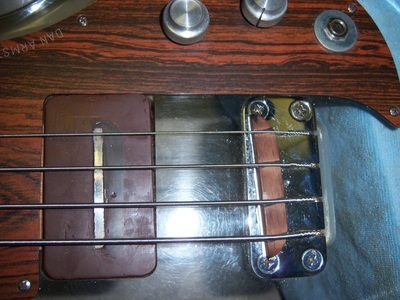 Only issues are a washer over the input jack (what lies beneath?) 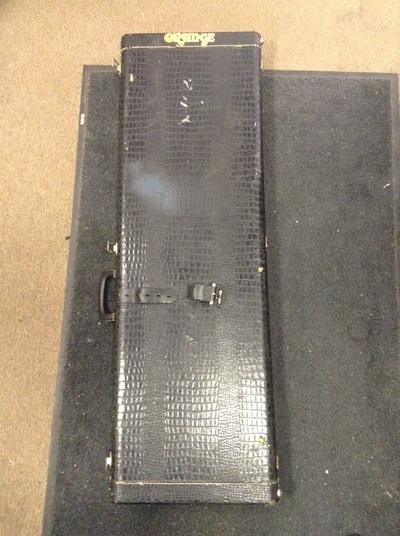 and a non-OEM case. 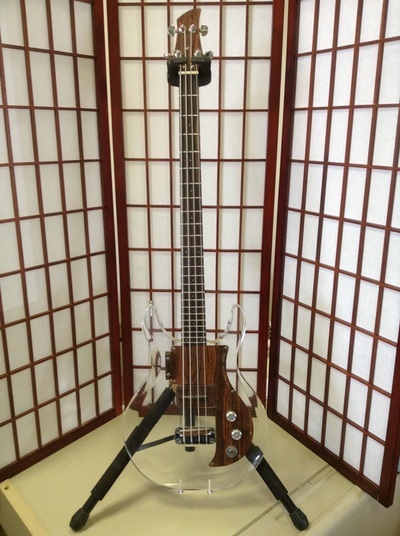 Bidding started at $200 and the bass ultimately sold for $1,425. 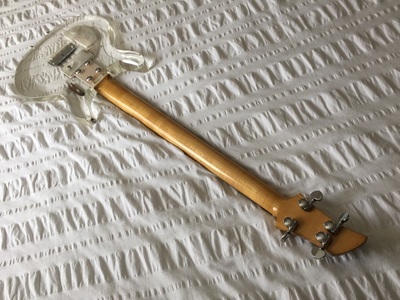 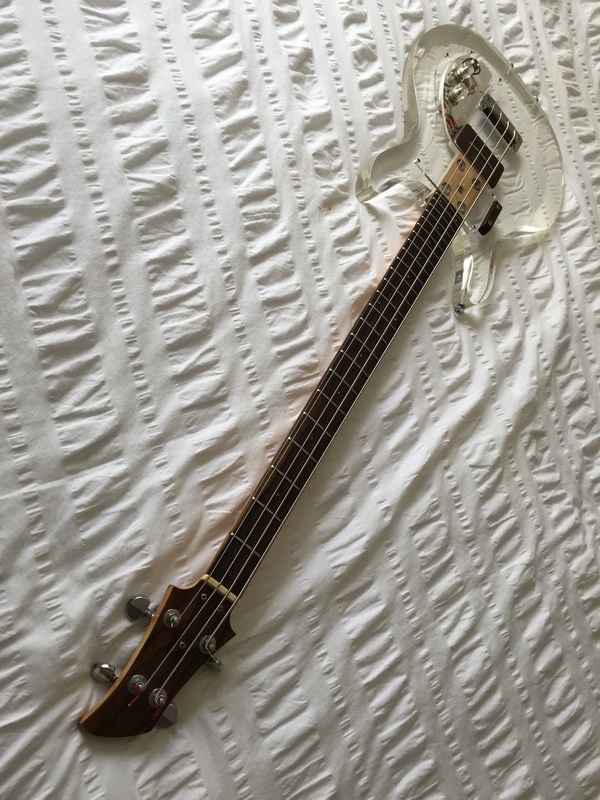 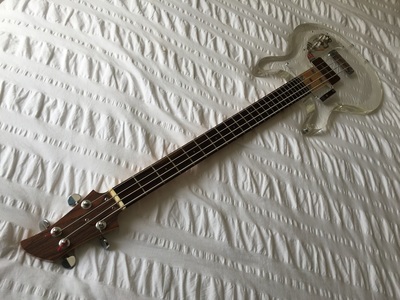 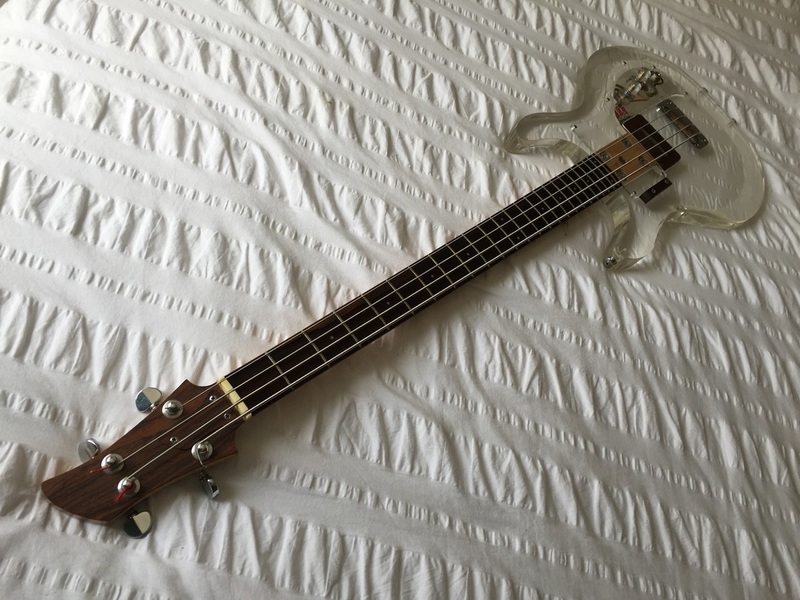 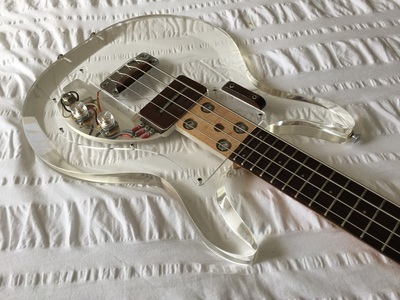 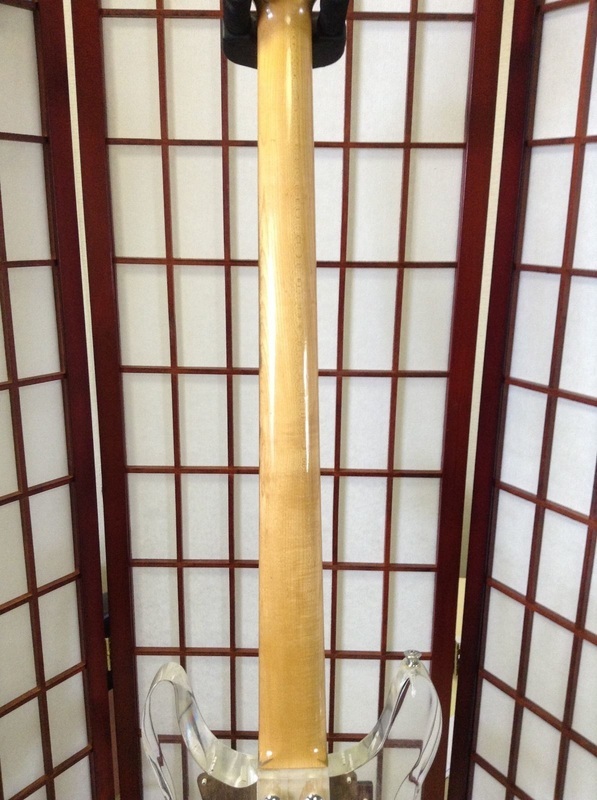 "THIS IS A VINTAGE 1970 AMPEG DAN ARMSTRONG CLEAR LUCITE BASS EXCELLENT CONDITION COMES WITH ORIG. 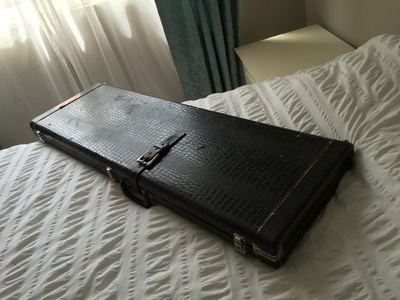 HARD CASE. 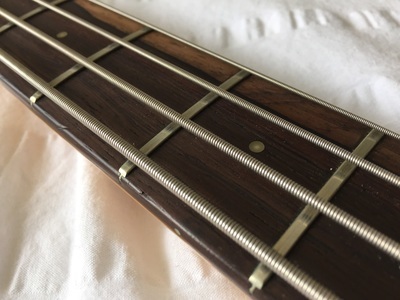 THIS IS A REAL STANDOUT BASS WITH A POWERFUL PICK-UP, THIS BASS FEATURES THE DAN ARMSTRONG ENGINEERED PICK UP THAT GIVES IT A FULL SPECTRUM OF SOUND, THERE ARE 24 FRETS ON A ROSEWOOD FINGERBOARD WITH A MAPLE NECK ONCE YOU SEE ONE YOU'LL NEVER FORGET IT, GREAT STAGE PRESENCE, OUTSTANDING SOUND." 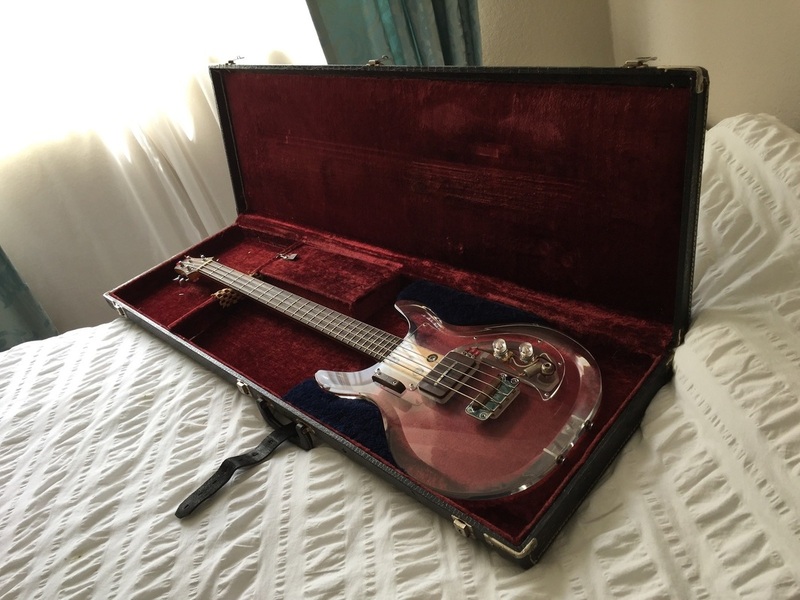 Back on the market in May 2016 with an asking price of $2,350. 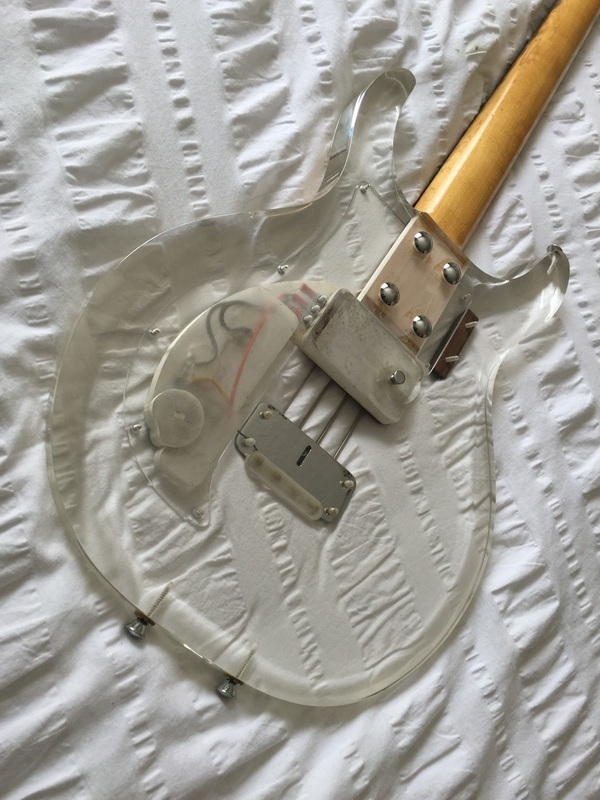 Electronics and pickguard have been changed out, as further described below. 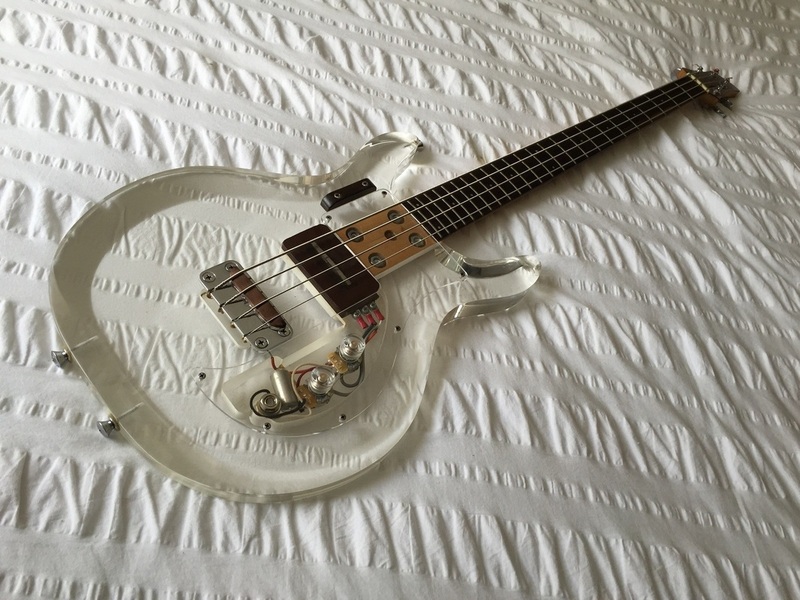 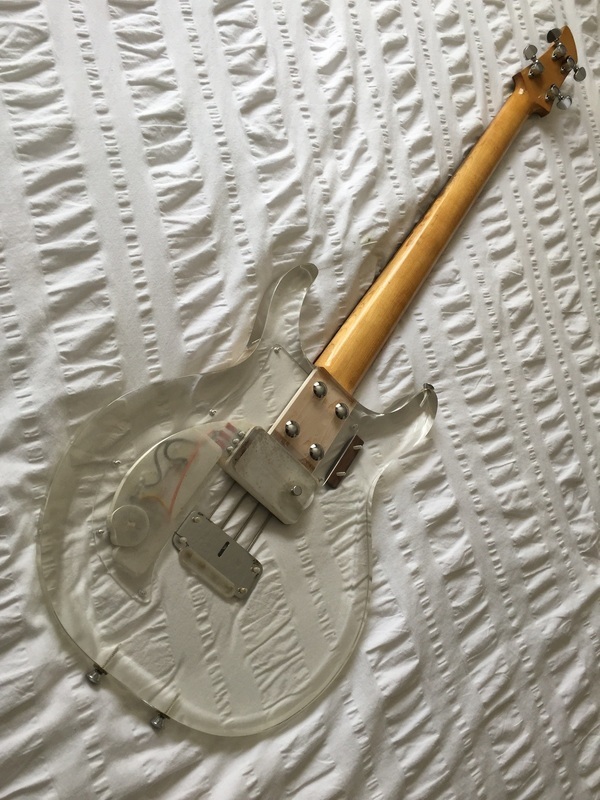 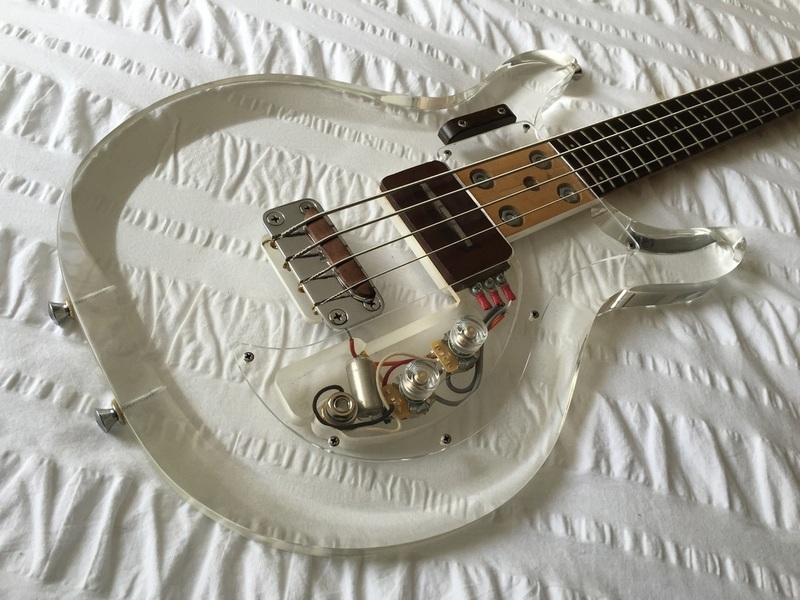 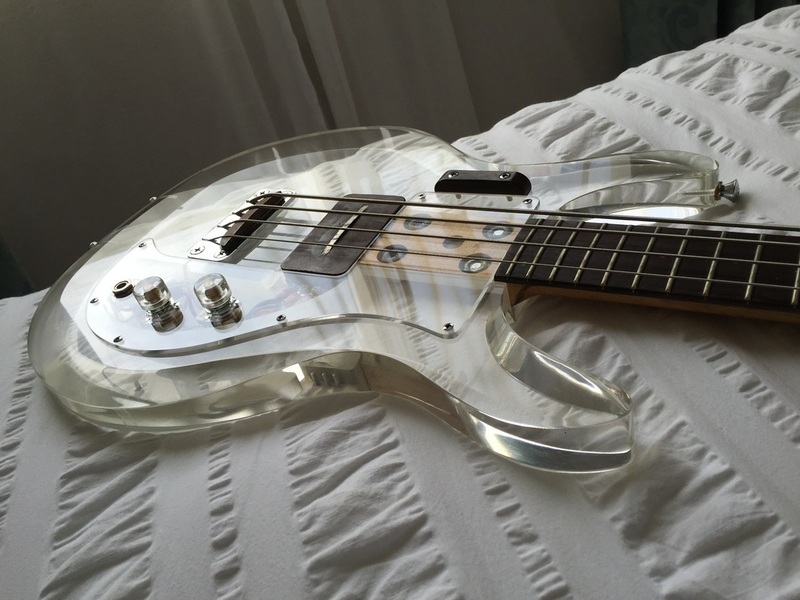 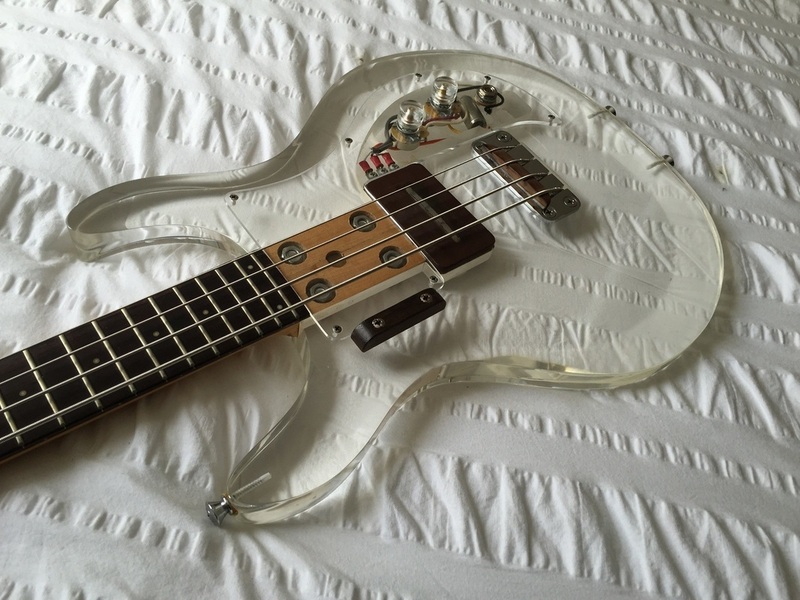 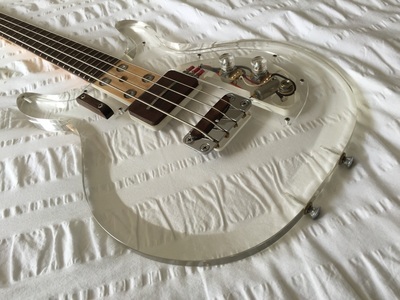 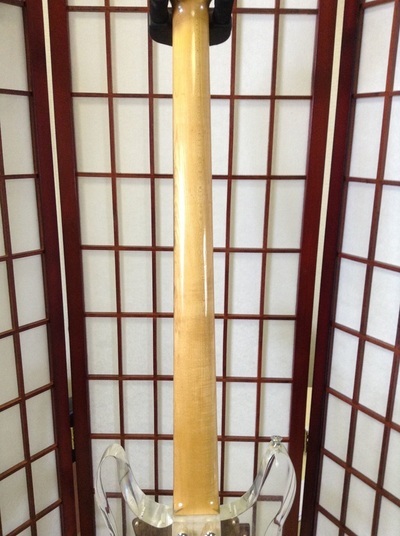 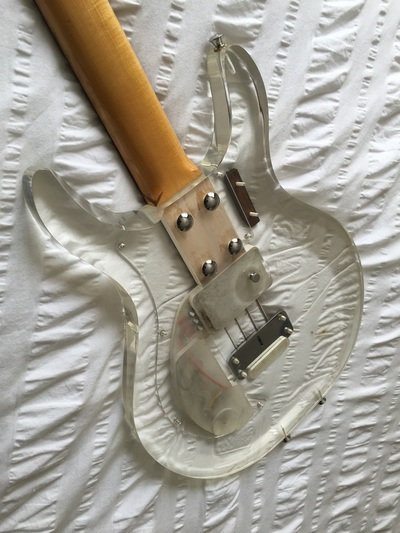 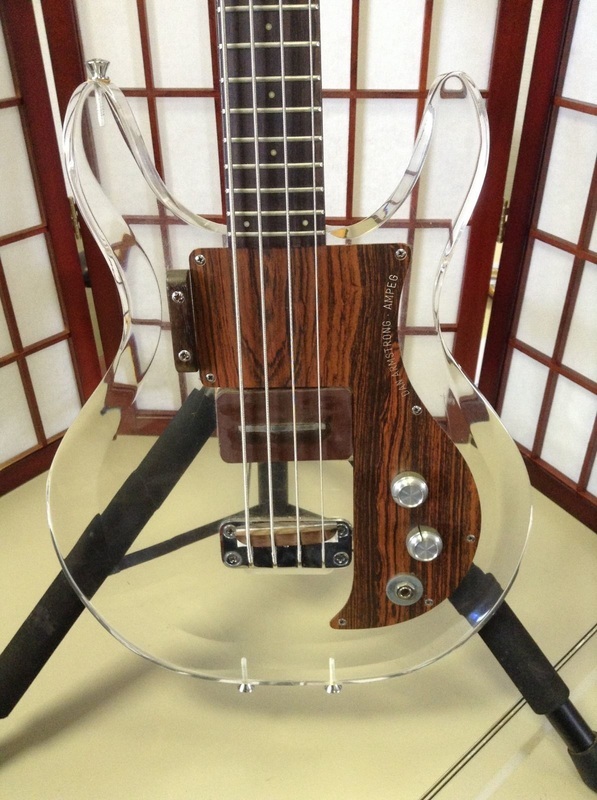 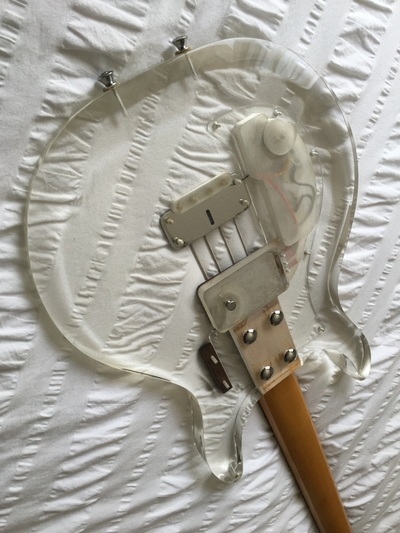 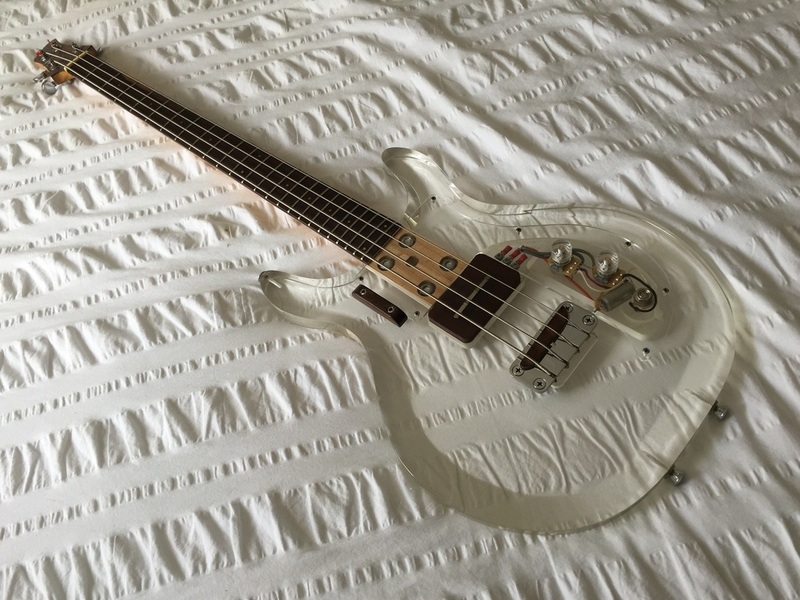 "Circa 1969 Ampeg Dan Armstrong ARMB-1 “see-thru” Lucite (acrylic) bass. 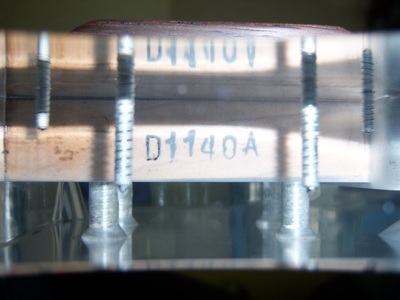 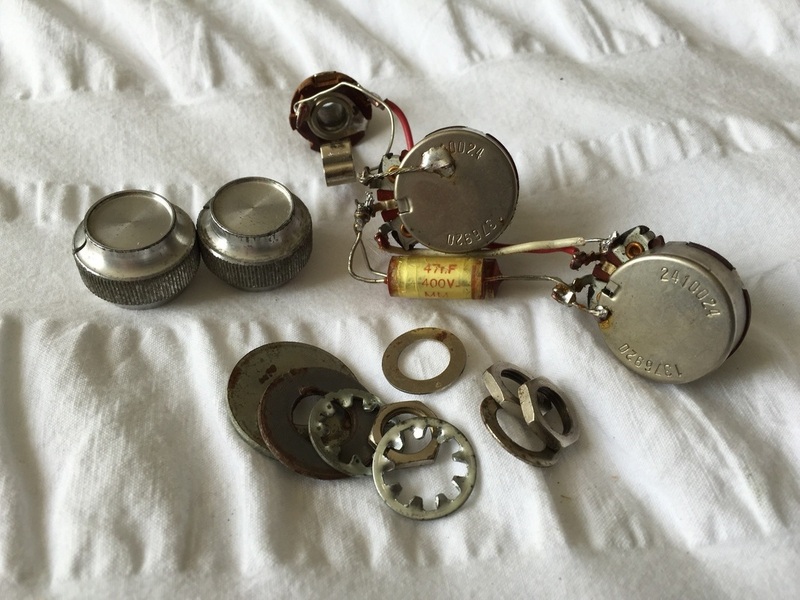 S/N 1140A; original CTS 200k potentiometers dated 20th week of 1969." 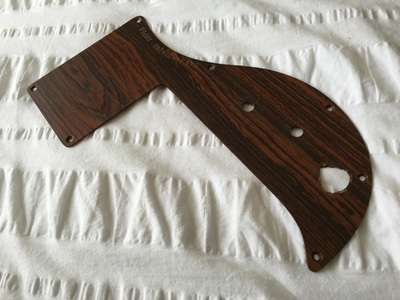 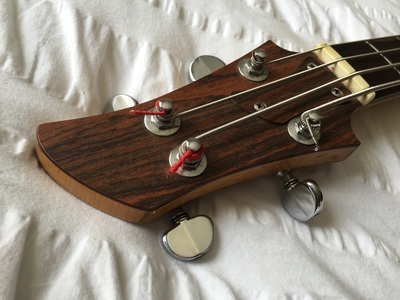 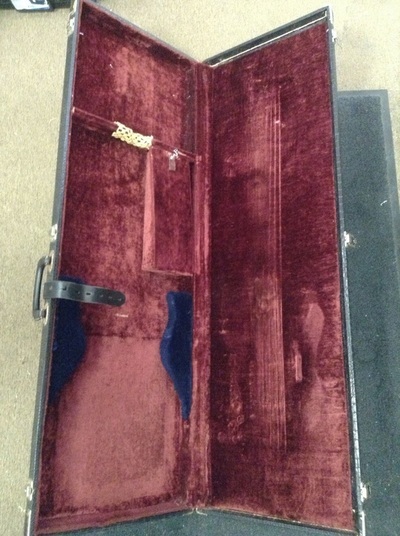 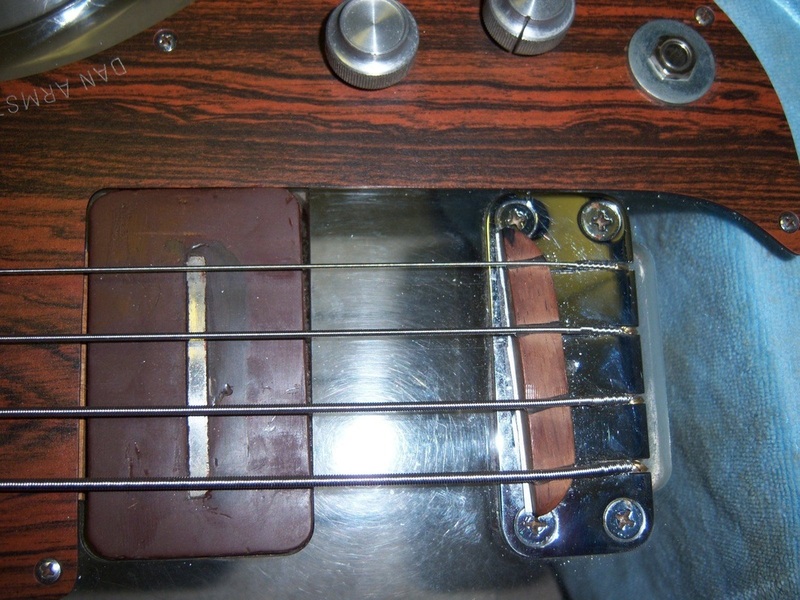 "Good condition…see photos for aesthetics; a few small scuffs, scratches, and wear marks from normal use, but there are no major defects or significant flaws; no functional issues - professionally setup by local well-regarded luthier; original pickguard typical failure around the jack…typical repair previously applied using two large washers." 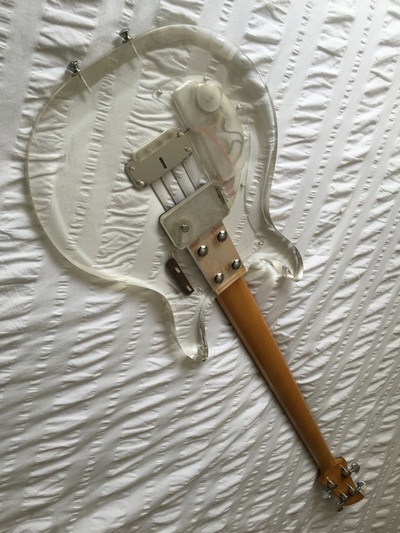 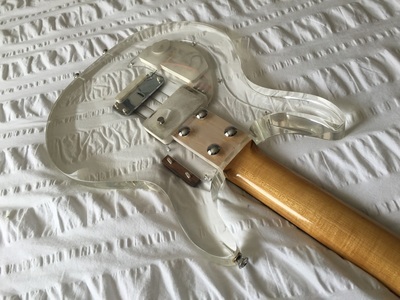 "Current modifications: The original pickguard replaced with 1/8*-thick clear plastic guard." 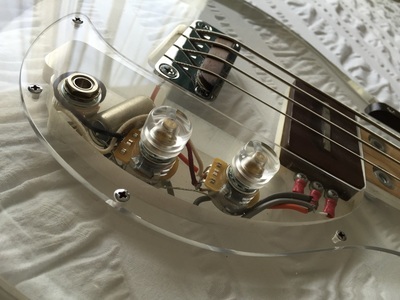 "The original wiring harness, which consisted of CTS 200k potentiometers and two parallel 0.47 mF 400 VDC paper tone capacitors were replaced; instead, a vintage-spec wiring harness was installed, but with CTS 250k (actual reading) potentiometers and a single Sprague Vitamin-Q 0.1 uF 400 VDC tone capacitor; this change makes this great bass even better, giving it a little more presence and results in a tone range that is more useful; professionally installed by local well-regarded luthier." 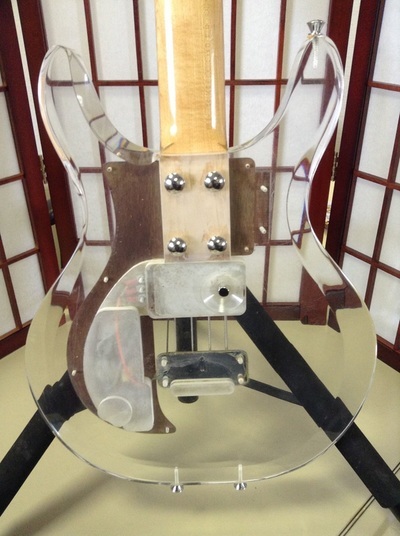 "Original volume and tone control knobs replaced with DeArmond ice-cube-style knobs; going clear and raw all the way! All original parts were retained and are included."